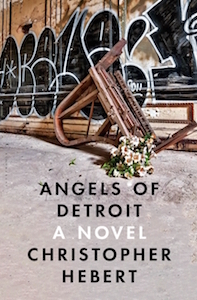 The following is from Christopher Hebert’s novel, Angels of Detroit, out today from Bloomsbury. He is also author of the novel The Boiling Season (HarperCollins, 2012), winner of the 2013 Friends of American Writers award. He is co-editor of Stories of Nation: Fictions, Politics, and the American Experience (forthcoming UT Press). Currently he lives in Knoxville, TN, where he is Assistant Professor of English at the University of Tennessee. She had never cared for cars. At least not in the way her brothers did. When they were teenagers, it had all been about fins, the roads swollen with schools of these absurd terrestrial fish. The power, the speed—she got all of that. She just never understood why there needed to be so many different kinds, so many she could never tell them apart. Whatever the distinctions were between a Dodge and a DeSoto, they meant nothing to her. She simply wanted one, she didn’t care what kind. In 1956, her father brought home a brand new two-tone Roadmaster with a grille like a sleeping toad. Her brothers got their turns first, and when they were done, Ruth slipped under her father’s arm and into the driver’s seat, wrapping her slim fingers around the knotty wheel. She was sixteen and she had never driven before, but she had the posture and the gestures down pat. “Will you teach me how?” she asked her father, who stood with his hand on the door, the smile wiped from his face. With a stiff laugh he said no, no, no, that her brothers would take her wherever she needed to go. And then he reached in and removed the keys from the ignition. She made up her mind that very moment that she would never ask anything from him again. Her father brought home a new car every couple of years. Her brothers inherited the old ones. 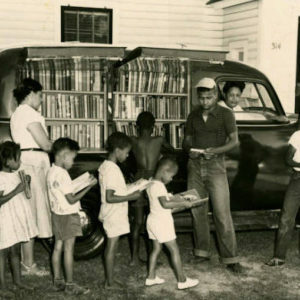 In ’58, Gus got the Roadmaster. By then, his friends were driving Corvettes and Thunderbirds—fish transformed into torpedoes—and by 1958 the Roadmaster was already as boxy as a casket. As for Ruth, she might not have cared so much about having nothing to drive if she could have taken a street car, but they’d ripped up the last of the tracks in ’53. And there was no dignity in a bus. So she did what any girl would do, and that summer when she turned eighteen, she told Francis Statler she’d go steady with him as long as he let her drive. He wasn’t the brightest boy, but he had dimples and held open doors and called everyone sir and ma’am. Besides, she’d known him forever. They lived only a few blocks apart in Palmer Woods, and although he went to Kingswood-Cranbrook and she went to Girl’s Catholic Central, their circles were more or less the same. They saw each other at socials and dances, at Tom Clay’s Saturday night balls at the armory. Francis was always staring at her through the bottom of an empty punch glass. In the summer they’d mingled deck chairs at the pool of the Detroit Golf Club, where their fathers shot rounds together. Her father worked in management at Ford, slowly edging his way up. Francis’s father was at GM, already a big cheese. On the fairway, Ruth’s father said Mr. Statler had a hopeless slice, but that didn’t stop the club from giving him his very own brass plague at the top of the donor wall. Francis Statler meant well, but he could never quite keep up, despite his father’s money. He wasn’t unattractive. Besides the dimples, he had deep hazel eyes and the straightest teeth Ruth had ever seen. His face was warm and inviting, but he parted his hair just like his father, and he’d been wearing the same plaid shirts since grade school. Francis was either indifferent to fashions or unaware of them. He always stood out, the one boy clinging to cotton twill slacks in a world that had moved on to blue jeans. In ’58, when every teen in the city was coveting sport coupes, Francis bought a turquoise Edsel. At least it was a convertible. From the front, the car looked like a disgruntled koala bear, but all Francis cared about were the frills: touch-button transmission, glowing cyclops-eye speedometer, power windows and seats. He could afford every option they offered. Some of her girlfriends expected Ruth to be embarrassed to be seen in something so uncool. “Doesn’t everyone stare?” Donna asked, but Ruth simply shrugged. Anything was better than nothing. And besides, people really didn’t stare at Francis. He somehow managed to get away with being strange. Were anyone to ask him his secret, Francis wouldn’t even have understood the question. Before Ruth took him up, Francis had no close friends. Hours might pass at the pool without anyone speaking a word to him, and yet the dopey dimpled smile never left his face. It was impossible to exclude someone who didn’t notice he was being excluded. Whatever was happening, Francis was always there. He became a sort of mascot, though no one could have said exactly what it was he represented. He rarely spoke, never danced, didn’t drink. And yet, by the time he and Ruth made their arrangement, a belief had spread throughout both their high schools that the dullest parties were the ones from which Francis Statler happened to be missing. For every gathering, someone was invariably dispatched to ensure Francis’s arrival, after which Francis would spend the entire evening by himself, examining the host’s parents’ collection of ivory statuettes until it was time for someone to take him home. For Ruth, the best thing about Francis Statler was that he didn’t mind handing her the keys. When they were together, the Edsel was hers. It was Ruth cruising Belle Isle with the top down, Ruth roaring north to the charred remains of Jefferson Beach. And there was Francis, grinning beside her with the wind in his teeth. The only exception was Friday night. When they pulled into Ted’s drive-in, it would be Francis behind the wheel. Ruth insisted. As a ritual, Ted’s was sacred: the trays on the windows, Frantic Ernie Durham shouting his strained rhymes through the radio: Ernie’s Record Racks! Whale of a sale! Whale of a sale! Ted’s was a place where, for better or worse, boys had to be boys. Although of course Francis never seemed to notice all the jockeying and revving. He was the only one not craning his neck to watch each tight sweater flouncing by. Ruth supposed he was in love with her. But it wasn’t that Francis was a saint. Nor was he a savant. He was more a like a traveler in a foreign land who understood neither the language nor the customs, but was quietly, respectfully accepting of everything he saw. One July weekend, as was the tradition, Francis took Ruth (or rather she took him) to watch the hydroplanes skip like stones across the murky Detroit River. Everyone they knew was there, and while the other boys shouted and clapped each other on the back, Francis sat with his hands folded in his lap, transfixed, as if God himself were presiding over the rumble and the wakes. Legs folded beneath her on the green plaid blanket, Ruth felt certain she saw the other girls, Donna among them, looking at Francis and then at her. She saw in their eyes not jealousy or judgment, but a kind of distrust. They didn’t want to date Francis Statler themselves, but they didn’t want anyone else to either. It wasn’t that he was like a brother to them, he was more like a newborn baby, someone vulnerable and helpless and in need of constant protection. Maybe these girls didn’t believe Francis could be loved. Maybe Ruth didn’t believe it either. By then they’d been together three months, and he hadn’t made a single move. One Sunday afternoon they were strolling the glass-domed paths of the Belle Isle conservatory, Ruth pointing out all the most beautiful orchids, when she realized Francis was no longer beside her. She doubled back through the rows of blooms and found him near the entrance, gazing up at the glass and steel lattice, the guy-wires and pulleys. There was a small bird trapped inside, flapping among the rafters, trying to find a way out. “We should help it,” Francis said. He started to whistle, as if he and the bird shared a common tongue. A young couple she didn’t know stared at Francis as he offered his finger as a perch. Meanwhile, Ruth inched away, lowering herself onto a little iron bench tucked away in a tiny alcove. She would have liked to disappear completely. With Francis, there was always waiting. He had a child’s sense of wonder, and it was peculiar how often Ruth’s adventures with him produced in her the feeling of returning to childhood things. That day on Belle Isle, after Francis was finally forced to give up on the bird, they went next door to the aquarium, which Ruth hadn’t visited since she was a little girl. She was struck by how small the aquarium felt that day, the single arched gallery seeming to close in on her from all sides. The place was dark and tight, and each recessed tank was framed in stainless steel, as if it were a port hole—the people imprisoned and the fish utterly free, swimming there of their own accord. She felt as though she were leagues under the sea in some sort of Gothic bathysphere. Francis was captivated by the four-foot-long electric eel, which slunk across its tank with its jaws a crude rictus of malevolence, its dead eyes fixed on some nonexistent prey. Ruth caught just a glimpse of the horrible creature, and then she had to turn away. But Francis couldn’t seem to get enough. He was still standing there a few minutes later when some sort of food was dropped into the water. The tank was rigged in such a way that when the eel ate, the current it produced surged to a light bulb affixed to the wall. As the light began to glow, Francis’s eyes grew wide, and Ruth couldn’t help wondering what the others would think if they were to see this side of Francis Statler, not the charmingly oblivious young man, but the guileless, naked boy. Before the eel could finish, Ruth slipped her arm in the crook of Francis’s elbow and pulled him out the front door. His head came last, eyes still locked on the display. She reached into his pocket then and pulled out the keys to the Edsel. He climbed into the passenger seat without a word. Without waiting for him to fully close his door, Ruth squealed out of the parking lot, swerving into the oncoming lane as she entered the road along the southern shore. Francis didn’t ask where they were going, and in fact she didn’t know herself until they got there, to the massive marble fountain about a mile away at the western end of the island. When they arrived, she got out of the car alone and walked briskly toward the fountain. She felt propelled by a great sense of purpose, but what the purpose was, precisely, she couldn’t have said. In defiance of nature, lions and turtles together spouted a froth of water into the already humid air. Ruth stood there in silence, looking past the fountain and out over the water, toward the city. She’d known from the start that her relationship with Francis Statler was not meant to last, but it had only just occurred to her that perhaps this fact had escaped him. It was a troubling realization, but what could she do about it? All she could think was how the other girls would judge her when that time finally came. And so, they stuck together, Ruth and Francis, even after the thrill of driving had worn off, after Ruth found herself more and more often sitting cross-legged in the passenger seat on their weekend drives to Walled Lake. The night he finally kissed her, they were at the Gratiot Drive-in. It was August, and they were about to enter their last year of high school. A group of them had caravanned up there together, and they were only a short way through Gigi when Francis put his arm around Ruth. Maybe he could sense how bored she was watching Maurice Chevalier do his shuffle in topcoat and tails, thanking heaven for little girls. As Francis leaned in, Ruth was thinking about the irony of watching such silliness in a city that had done so much to destroy the French language, turning Bois Blanc to Bob-Lo and Gratiot into Grash-it, not to mention Detroit itself. And then, in a flash, Chevalier’s walking stick was replaced with Francis Statler’s nose, shiny with grease and terror. She didn’t try to stop him. She was pleased to be done with the horses and carriages and silly parasols. And yet, she couldn’t help being aware of the many eyes turned to face her. There was Donna and Robert to her right, and she didn’t remember who else, but there had been at least five cars. Ruth and Francis were surrounded on all sides, and soon a cheer rose up. That was the moment Ruth pulled back, wiping the damp from her mouth. Taking Francis by the hand, she pulled him out of the car, past the box offices, and a minute later they were alone outside the theater. Alone, but it hardly felt private out there. There was so much light all around them, it felt like mid-afternoon. The sky pulsed at their backs with every flashing image on the screen. For Ruth, the Gratiot Drive-In wasn’t really about the movie. Especially when the movie was something like Gigi. There were plenty of places closer to home: the Bel-Air, the Eastside, the Ford-Wyoming, the Town. But none of them had what the Gratiot had, the movie screen built onto a one hundred-fifteen foot tower, from the top of which, on the highway side, cascaded an actual waterfall—the spray illuminated by a kaleidoscope of colored bulbs. It was both beautiful and absurd, surely the world’s only liquid marquee. It was the spectacle that she marveled over, the ambition so peculiarly placed. It was said the construction cost four hundred thousand dollars. Ridiculous! But could she say the money had been poorly spent? Here she was, after all, gazing up at the red and yellow mist. And as they stood by the railing in front of the pool into which the water fell, Ruth saw that Francis Statler was trembling, and at first she thought he’d somehow gotten wet. But that wasn’t it, and it wasn’t just nerves any more, either. Although it might have flattered her to think so, she understood he wasn’t shaken by an overwhelming passion. He was miserable. Leaning against the rail, she pulled him toward her, and he collapsed onto her shoulder. “It’s okay,” she told him. “It’s okay.” That was the moment it occurred to her to wonder if perhaps all of this weren’t complicated for him, too, and in ways she couldn’t imagine. When they got back to the car, the others were poised for celebration. Good old Francis had finally done it. Even the other girls looked upon Ruth with a respectful warmth, as if she’d now proven she would not hurt this gentle boy no one else wanted. At Ruth’s insistence, Francis Statler took the wheel, and the others marked his triumph by making him lead the way to the Totem Pole, grandmaster of their small parade. Ruth squeezed next to Francis on the bench seat, their bodies combined into one shadow, but down in her lap, where no one else could see, Francis’s hand had gone limp. At the Totem Pole, Francis ordered a burger, but he seemed distracted, and Ruth had to be the one to remind the waitress to bring his customary extra pickles. As the other boys squeezed his shoulders and mussed his hair and called him Casanova, Francis contorted his bendy straw into unrecognizable shapes. Stuffed beside him in the overcrowded booth, Ruth quietly sucked on a cherry-flavored ginger ale, a drink she loathed but had ordered anyway, feeling somehow it was what she deserved. With every sip her tongue became more sharply preserved in the cloying, medicinal sweetness. And when the glass was empty, she realized she’d inadvertently erased every trace of Francis Statler’s kiss from her lips. For the rest of the night, she clung to his side, smiling whenever he looked her way, but there were no more kisses. At eleven, Francis pulled up to the curb in front of Ruth’s house, the Edsel still running. With lowered eyes he wished her good night. Francis lived on Balmoral too, the biggest house in the neighborhood, an eight-bedroom colonial with presidential-looking columns and an English garden in the back. Ruth’s father passed the Statler mansion every morning on his way to work, never tiring of the view. Ruth’s house had a circular drive, but Francis never used it. He seemed to prefer having a buffer of yard between him and her front door, as if he were afraid of falling within her father’s reach. She could have told him there was nothing to fear, that Ruth’s father worshipped the Statlers, that Francis himself could do no wrong. But that was something Francis could never know. Ruth let her fingers linger on the door handle, giving Francis one more chance to take the cherry from her lips, but his gaze would not budge from his lap. The summer faded into fall, and fall quickly dissolved into winter. All at once, it seemed, the excursions to the club to swim and play tennis were replaced with parades downtown and skating at the pond at Palmer Park. A week before Christmas, Ruth and Donna took a bus downtown to buy presents for Francis and for Richard, Donna’s new boyfriend. The city had painted the bus in white and red stripes, like a candy cane, and the driver wore a matching vest. Ruth knew she was too old for such things, and she made a point of rolling her eyes at Donna as they boarded, but secretly the one time she loved to ride the bus was at Christmas, high above the snow and slush, watching the tinkling lights and laurels strung from all the buildings. Nothing made her more sentimental than Christmas, and Christmas at Hudson’s department store most of all. From ANGELS OF DETROIT. Used with permission of Bloomsbury. Copyright © 2016 by Christopher Hebert.